Jesuits are, properly termed, members of "The Society of Jesus"; the name "Jesuit" was apparently coined by the Protestant, Calvin, although it is commonly used even today by Roman Catholics. The Society was founded by a Spanish soldier, Ignatius of Loyola in 1539. He originally called his order "The Company of Jesus," an indicator, no doubt, of the militant, aggressive spirit that imbued the organization. Although the Company was not founded expressly to combat Protestantism (Martin Luther put his 95 Theses up on the castle church door in Wittenberg in 1517), it was in the forefront of the movement of Catholic revival commonly called the "Counter-Reformation," the official origins of which were at the Council of Trent in 1545. The Jesuits were (and are) extremely active in missionary activity throughout the world and are known, as well, for their charitable work and emphasis on education. From the very beginning, the order of Jesuits was marked by a supranational sense of mission. Their ultimate religious allegiance was, of course, to the Pope, but they also swore allegiance to the head of their order, the General, an office that became so strong in the course of the centuries that its holder was often termed —unofficially, of course— "The Black Pope". That kind of situation breeds a sense of, at least, semi-autonomy, guaranteed not to sit well with an earthly monarch. In a way, obedience to God before King made some sense in the Middle Ages, especially the early Middle Ages, before there were European nation states. There certainly was a time when you were, first of all, a Christian before you were Spanish or French or German. Yet, by the 1500s, and certainly the 1600s, that sense of overarching obedience to the princes of the Church over the princes of the Earth was an anachronism and was one of the factors that contributed to the conflict between the Jesuits and the rulers of Europe, a conflict that led to the eventual suppression of the order. By the mid-1700s, Jesuit activities in the mission field, in commerce, trade and banking (in order to have money for their missions) —behind-the-scene intrigues (according to their critics)— had created such ill feeling between them and, primarily, the Bourbon monarchs of Europe (France, Naples, Spain) that there was wholesale call from those nations to the Pope to abolish the order. 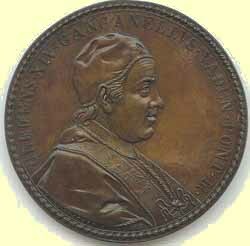 Clement XIII, a friend of the Jesuits, was elected Pope in 1758. When he died in February 1769, a conclave to elect his successor assembled in Rome. Those charged with electing the new Pope were beset by a powerful coalition of anti-Jesuits from Spain, France and Naples whose single purpose was to get someone elected who would abolish the Jesuit order. Representatives from those nations were —at least, so they said— prepared to wage economic, military, and even religious war (that is, they threatened schism) against the Papal States unless they got what they wanted. Such intrigues are beyond me, but, interestingly, the choice for Pope went to one who had been educated by the Jesuits —Cardinal Ganganelli, who took the papal name of Clement XIV (medallion, above). The Pope was reluctant to suppress the Jesuits. He still had some political backing from the Hapsburgs in Austria, who, obviously, were against anything the Bourbons were for. That support faded when empress Maria-Theresa married off one of her children, Marie Antoinette, to the Bourbon king of France. Part of the agreement was that Hapsburg royalty stop defending the nefarious Jesuits. A common thread in the expulsion of the Jesuits in Spain and then Naples is that Charles III of Bourbon was the King of Spain when the Jesuits were forced to leave that nation, and his son, Ferdinand IV was the king of Naples when the same thing happened there. (Charles, of course, had ruled Naples before abdicating to return to Spain.) Influential in the lives of both monarchs was Bernardo Tanucci (portrait, right), the astute Foreign Minister under Charles III and then the regent of Charles' child-king son. Tanucci was one of the prime movers among anti-Jesuits in Naples. His influence faded after that, and he was edged out of the picture by Ferdinand's ambitious wife, Caroline. The Jesuits didn't return to the Kingdom of Naples until 1827, well after the initial wave of anti-Jesuit feeling and well after the ultimate anti-cleric, Napoleon (acting through his puppet-king, Murat), had caused all monastic orders in Naples to be abolished. 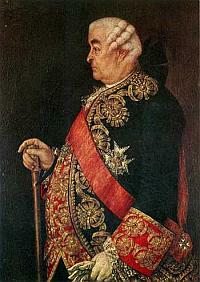 The Restoration of 1815 had its way and the order eventually came back to Naples. In 1860, they were again dispersed as part of the general wave of anti-clericalism in the new united Italy. In Naples, the Jesuits have again had premises since the opening of the Jesuit high school in 1874, now called the Pontanto Institute, and they run a respected university, the San Luigi Papal Theological Seminary of Southern Italy, (Pontificia Facoltà Teologica dell'Italia Meridionale, San Luigi) located on via Petrarca in the Posillipo section of the city (photo at top). In its present form, the school has existed since 1969; it was a fusion of two pre-existing university religious departments: The Neapolitan Theology Department of the University of Naples (Facoltà Teologica Napoletana) and the San Luigi Theology College (Facoltà Teologica San Luigi) run by the Jesuits. In addition, other religious institutions in southern Italy are now affiliated, including the Theological Institute of Calabria (Istituto Teologico Calabro) and the Theological Institute of Puglia (Istituto Teologico Pugliese). The institution confers higher degrees in ecclesiastical studies and is in full communion with the Holy See.